I was searching for few ways to transfer pictures to cakes other than using the piping gel. 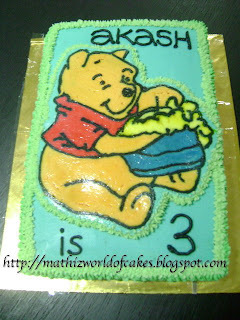 And I came across this website http://www.cakecentral.com/article12-How-To-Create-a-Frozen-Buttercream-Transfer.html. This website teaches the step-by-step of frozen buttercream transfer. So I made these two cakes using the same method. I still need to improve my skills on this method. What problem I faced..the smoothness of the picture..it's not that smooth enough. Anyway, people were amazed with the cakes, though. yummy...all your cakes are stunning! Nice that you have posted your cake pics on the web. Now i know where i can get my online designer cakes from. All the best Mathi & Jega.